Congolese Activists Honored For Fighting Oil Exploration In Virunga National Park : The Two-Way The Alexander Soros Foundation has given awards to people trying to block a British company from doing drilling in the park. The activists fear the operations would damage human and wildlife habitats. One-quarter of the endangered mountain gorilla population lives in the Virunga National Park, which activists are trying to protect from oil exploration. Virunga National Park, home to roughly a quarter of the world's remaining 880 mountain gorillas, was featured in Dian Fossey's Gorillas in the Mist. This week, the Alexander Soros Foundation gave its annual Award for Activism in Environmental and Human Rights to two activists from the Democratic Republic of Congo who have resisted the efforts of SOCO International, a U.K.-based oil company, to prospect for oil from Virunga National Park. The park, which is classified as a World Heritage Site by Unesco, straddles the Congo-Uganda border. Conservationists and residents in the region cried out against oil exploration in the Virunga after a contract was awarded in 2010. In addition to the endangered mountain guerillas, lions, elephants, and hippos live there. 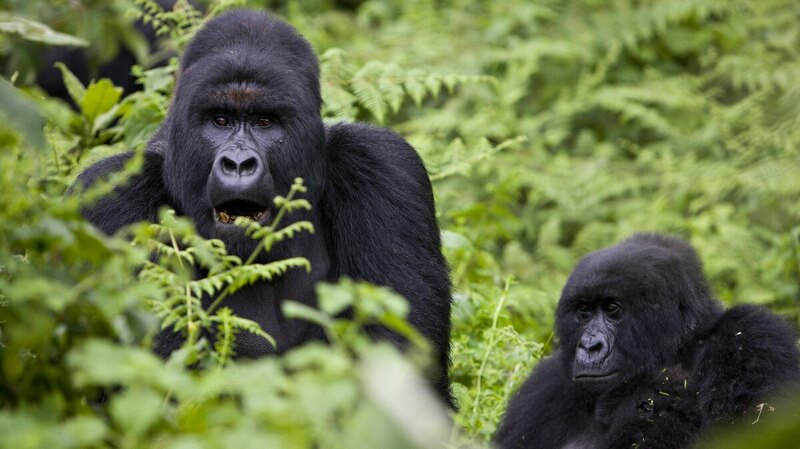 The World Wildlife Fund maintained that, by virtue of Virunga's World Heritage Site status, SOCO's activities in the Virunga were prohibited by international law. Tens of thousands of Congolese residents fish on Virunga's Lake Edward. One of Soros' awardees, Alphonse Muhindo Valivambene, is a fisherman. In an interview with NPR this week, he said he and many other fishermen had been adamantly opposed to the seismic testing the company conducted in the lake, because it threatens their livelihood. Valivambene alleged people allied with SOCO had first tried to bribe him and later threatened him when he did not end his protest against the oil prospecting. His co-awardee, Bantu Lukambo, an environmental activist, said he too had received threats, forcing both of them to temporarily flee the country. These are not the only allegations of intimidation and violence. Some villagers who opposed SOCCO's activities reportedly were beaten by government soldiers. Emmanuel de Merode, a Belgian who serves as director of Virunga National Park, was shot and nearly killed the day he submitted a report on SOCO to local authorities. In the Oscar-nominated documentary Virunga, a Congolese army major is featured offering a bribe to a park ranger. Global Witness, a non-governmental organization that advocates for greater transparency in the mining, oil, and gas sectors, released documents earlier this year that they claim prove SOCO paid the major tens of thousands of dollars. A SOCO spokesperson declined to comment TO NPR on the record about the allegations. In August 2014, SOCO announced that it had ceased operations inside the park. There are questions, however, as to whether it has. According to the New York Times, the company's chairman, Rui de Sousa, said at SOCO's annual general meeting that year: "We have not pulled out." Activists are concerned that if significant reserves of oil are found in the park, Virunga's boundaries will be redrawn. And that would allow SOCO to drill while honoring its commitment not to operate within the park. Alexander Soros said that recognizing the work of local activists was strategic. "If you put a face on them, the chance of them being killed goes down," he told NPR. The activists were in Washington last week, and according to Bloomberg News, they met with U.S. State Department officials, advocating for an investigation of SOCO's activities in the park.